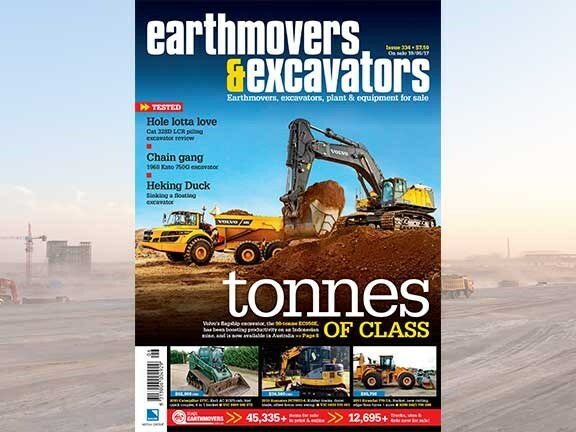 Earthmovers & Excavators issue 334 is on sale now and is packed full of the latest news and reviews, as well loads of new and used equipment for sale. This month’s cover features Volvo’s new heavy-duty 90-tonne monster, the EC950E excavator. The big digger is available now in Oz, but before you rush out have a read of the work it’s been doing at a mine in Indonesia. Bobcat has launched the T595 compact track loader in Australia. This is the latest model in Bobcat’s popular 500-frame size class. And last but definitely not least is Ron Horner’s epic tale of the sinking (and rescue) of a Heking HK150SD amphibious excavator.